Core/wedge, slice and dice a variety of fruits and vegetables. 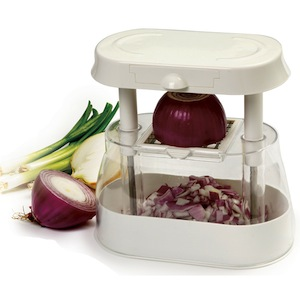 Includes 3 interchangeable stainless steel blades: Core, Wedge, Slicing and Dicing. Large "easy-view" container collects food. Telescopic arm allows for larger ingredients. Spring loaded for effortless chopping. Store all pieces in compact base for easy storage. Cleaning tool and instructions included. Hand washing recommended.